Science And Technology In India: What Can We Learn From Gandhi? Technology : Master or Servant? Pax Gandhiana : Is Gandhian Non-Violence Compatible With The Coercive State? Mahatma Gandhi's influence extended beyond the borders of India to the rest of the world. In every forum, the world over, wherever the political, economic, social and ecological future of humanity and preservation of the planet earth, our common home, is debated and discussed, Gandhiji with his simple precepts provides a guidance for all generations.1 Delivering the Mahatma Gandhi Memorial Lecture to commemorate the 143rd birth anniversary of Mahatma Gandhi on 2 October 2012, Indonesian Vice President Boediono rightly said: “Mahatma Gandhi was an extraordinary human being, a man whose inspiration, thoughts and beliefs continues to influence us,"2 Mahatma, “the guiding light of our inspiration” advocated non-violence as a means of overcoming oppression and suppression. His inherent spirit of forgiveness and reconciliation profoundly moved the humanity towards a perfect civilized society. In Indonesia the impact of Gandhian ideologies has been felt with the work of Gedong Bagus Oka, a prominent Indonesian intellectual, known for her contribution in the establishment of the Ashram Gandhi Canti Dasa in 1976. She was internationally acknowledged as a devotee of Mahatma Gandhi's philosophy. She dedicated herself to finding ways that Mahatma Gandhi's teachings could be applied to daily life in Indonesia. She felt firmly and sincerely that Indonesia could progress in peace and according to her own identity only by following the principles of Mahatma Gandhi. After undergoing a primary and secondary education in Bali and Yogyakarta, she went on to study at the Christelijke Paedagogische Algemene Academy in Jakarta. She completed her course at the Dutch Teachers Training College at Batavia (Jakarta) in 1941. In 1941, Ibu Gedong returned to Bali to teach at a higher secondary school (Sekolah Lanjutan Atas) in Singaraja and to become its headmistress later. During the struggle for Indonesian independence as well as in the formative year of the new Indonesian nation state, she fought for a strong role of religion within the new Indonesian society.6 She took her Bachelor Degree in English (Sarjana Muda) at the Universitas Udayana in Bali's capital Denpasar in 1964. Since 1941 she has been in the teaching profession. An educator both by training and inclination, Ibu Gedong, served as the head of the SMA I High School at Singaraja in Bali from 1956 to 1964 and she taught English at the Faculty of Lettres (Fakultas Sastra) in the Udayana University between 1965 and 1972. Then, she worked as a Hon. Lecturer on the staff. Being one of the first Balinese women who received a higher school education, Ibu Gedong has also contributed to the emancipation of women in Bali through her foundations Yayasan Kosala Wanita (Foundation for the Development of Women) and Yayasan Kesejahteraan Perempuan (Foundation for the Welfare of Women), pleading for a general secondary school education for women and for the use of natural medicine and yoga as a kind of cheap, yet effective preventive medicine available to everybody. Her social activities mainly focused on the welfare of women and children from poor families.7 During that period, her activities started to get a much more spiritual focus, leading to the foundation of the Yayasan Bali Santi Sena (The Balinese Peace Front) in 1970. She was a member of the Indonesian Parliament and Congress from 1968 to 71, Executive Director of the Asian Conference on Religion and Peace since 1976 and a member of the Advisory Board of Bina Desa, a national umbrella body for the non-governmental organizations in Indonesia since 1984. She was also a prominent co-founder and former vice-president of World Conference of Religions for Peace and a trustee of Sarvodaya International Trust, a Bangalore-based international organization. She was married in 1949 to a ranking Balinese government official, I Goesti Bagoes Oka. In her husband, she had found an inspiring and supportive spiritual companion with whom she shared a growing enthusiasm for the teachings of Gandhi. From this fulfilling marriage, six sons were born. The ashram has influenced countless young Balinese seeking a closer relationship with their religion and the teachings of Gandhi. Student staying at the sea-side centre undertook a programme of religious study, meditation, and thoughtful discussions on how best to be of service to their local community. Public Health: In the local community the focus is on delivering actual health through its well established Nature Cure Health Clinic (acupuncture and traditional herbal medicine) centres. The ashram runs 3 community health centres in contiguous villages each of which is within walking distance of the villagers' homes. Nature-cure and acupuncture treatment are also offered. Rural Development: Work projects in the spirit of svadeshi were designed to improve the local agriculture on the basis of the traditional knowledge for which Bali is famous. Rishikriti or â€˜non-violentâ€™ farming, whatever it costs is used for growing rice and vegetables. After 16 years, farmers are starting to plant indigenous Bali paddy leaving the "miracle rice" to the fellow farmers who are more interested in making money. Chemical fertilizers and pesticide sprays are not used for Bali Paddy and though its yield is smaller, its health and nutrient is a preventive against various diseases and ailments. Ecology: The furniture of the ashram are all hand-made, donated or come from bulk rubbish. It is impressive how naturally the youths and young adults adopt this life of voluntary simplicity and give visitors and guests an insight to it. By this they not only set an example to neighbouring villages but also inspire social movements all over Bali for an eco-friendly life in harmony with nature, social justice and small-scale income generating projects. More and more theyâ€™re recognized and consulted by Baliâ€™s politicians for the community tackles and solves internal and external problems in a nonviolent Gandhian tradition and their overall experience can benefit the society on the whole.17 The ashram has educated people about the evil effects of plastic litter to the soil with the result that at present their own compounds are free from this litter. A movement for similar treatment of public grounds and public places is in hand. Education: Main focus is on delivering education services through introducing Gandhian ideals to the ashram run kindergarten and to its own cadres of ashram's young members. School education was provided for orphans and children from poor families in the community. Nearly 50 children are undergoing schooling in the Kindergarten class. Free lunch is offered to the children and this has resulted in improved health even after barely 3 months of attendance. Cleanliness is also improving. The ashram does not only educate Balinese children but is also open to foreigners of all walks of life and from various religious backgrounds who want to deepen their spiritual understanding in contemplative surroundings. Students could also listen to spiritual lectures and study sacred literature available in the ashram library. Spiritual Development: The daily religious practice in the ashram consists of common prayer and chanting, yoga, meditation, and a simplified form of the Vedic fire ritual, the agnihotra. The students have the chance to listen to spiritual lectures and are encouraged to study the sacred literature in the library of the ashram individually. Voluntary Programme: This programme has enabled participants from overseas to come and live in the ashram for 2-3 months. Only such persons as are conversant with the skills and have genuine interest in the principles of ahimsa and sathya are allowed. Through this programme the idea of "belonging to the one world" has been promoted. In the course of 8 years, the ashram has become aware of its potential for training and inducing people to lead a holistic life seeking peace of soul and harmony with nature and us. It is not only a practical training ground for the preservation of Gandhian values, but also a take-off for people who are interested in the propagation of such values to spread the message of Gandhi elsewhere in Indonesia. From that point of view Oka's single-minded determination and commitment for the propagation of Gandhian values as a panacea for the evils of the world and for peace and harmony among all people is a landmark in dedication to moral values which will survive for all time.18 While pursuing her responsibilities at the Ashram Gandhi Santi Dasa, Ibu Gedong was still occasionally teaching English at the Universitas Udayana as well as lecturing on spiritual topics both within Indonesia as well as abroad. Her work has taken her frequently to India, where she regularly participates in seminars and other events organized by the Gandhi Peace Foundation. In 1996, she established the Ashram Bali Gandhi Vidhyapith in Denpasar which educated students about Gandhian thoughts at the local universities. Yet another ashram was established in Yogyakarta which now has followers from local Hindu community as well as Muslims and Christian Javanese. In April 1999, Gandhi ashram dedicated a public monument to Mahatma Gandhi in the form of a life size statue, which was erected in front of the ashramâ€™s Denpasar branch office. This is the first monument in Indonesia honouring Mahatma Gandhi.19 Ashram Gandhi Puri was established in 2001 in Denpasar by BR Indra Udayana, inaugurated and given its name by the late Ibu Gedong Bagoes Oka. Always pro-actively fighting for inter-religious harmony and understanding, she has been able to develop constructive relations with open-minded Christians such as Dr. Thomas Sumartana, Head of the Institut DIAN/Interfidei, dedicated to the promotion of inter-religious discourse in Indonesia, or the pastor and Christian intellectual Dr Eka Darmaputera. Out spoken in her defense of Balinese cultural values, Ibu Gedong opposed a number of changes occurring in Bali. In a period when opposition to the established powers in Indonesia required substantial courage, she vehemently and publicly opposed the building of the Bali Nirwana Beach Resort and Garuda Wisnu Kencana Cultural Park. Internationally acknowledged as a devotee of Gandhi's philosophy, Ibu Gedong once served as the Vice-President of the World Council for Religion and Peace, headquartered in New York City, and was the recipient of numerous awards and citations for her many works. In 1994 she received the International Bajaj Award from the Bajaj Foundation in Bombay for continuously spreading the ideas Mahatma Gandhi and promoting Gandhian Values outside India. In October 1999 her achievements were crowned with her election as a member of the Indonesian Parliament under the leadership of President Abdulrahman Wahid and Vice-President Megawati Soekarnoputri. She served as a representative of Indonesian Hindus at the People's Representative Council in Jakarta. Besides her parliamentary duties, she continues to translate English collections of the sayings of Gandhi into Indonesian.. Following the fall of the Suharto regime, Ibu Gedong also served as a member of the Indonesian Parliament (MPR) representing Bali. Indonesian government issued stamp to honour Ibu Gedong on 21 April 2014. Ibu Gedong passed away at the age of 82 on Thursday, November 14, 2002, following a period of prolonged ill-health in Jakarta, where she was being cared for by members of her family. To conclude, Gedong's adoption and interpretation of Gandhian thoughts in the Hindu Dharma brought her public prominence. She is remembered for her immense contribution to inter-religious harmony and education. 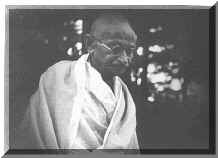 Her Gandhi Ashram has been successful in conveying the message of Mahatma Gandhi in Bali and Java. She translated Gandhian ideals of living into action and to promote a life of simplicity (which also implies sustainability and care for our environment), self-sufficiency and service to the community. Thus while ahimsa (nonviolence), satya (truth) and karuna (compassion and, by extension, universal brotherhood) are its guiding principles, in practice it is swadeshi (self-sufficiency) that shapes the sshram's economic and productive activities.